Beginning from Windows Vista, Windows operating system underwent drastic changes at its code, likewise for the jump from Windows 7 to Windows 8 and later. As the result, Windows 10, Windows 8.1 and Windows 8 are different from Windows 7 and Windows Vista, while all of them is very much different from Windows XP in kernel design, graphics, security control, and many other aspects. Although most programs previously works properly in Windows XP should run smoothly in Windows Vista, Windows 7, Windows 8, Windows 8.1 or Windows 10 too. However, some old programs or legacy applications may have compatibility problems and issues when running in newer Windows operating systems, making the program unable to run, distort display, cannot right click and etc. In this case, Program Compatibility mode can come to a rescue. Windows OS offers Program Compatibility mode that allows users to run programs not compatible or not compliant with newer version of Windows, such as those written specifically for earlier versions of Windows or using features that no longer exists. Right click on the .exe or .com executable file for the program that needs to be run in compatible mode. It’s also possible to right click on the shortcut to the program instead of actual executable itself, which is more accessible on Desktop, Quick Launch bar or Start Menu. On the right click contextual menu, select Properties. 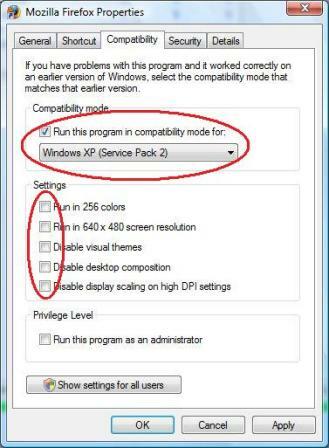 In “Compatibility mode” section, check the Run this program in compatibility mode for: option’s checkbox. Then, in the drop down list, select the operating system that you want Vista to emulate in the compatibility mode. In most cases, Windows XP (Service Pack 2) will work. In some really old programs, there may be a need to configure other settings if simple Windows XP compatibility mode doesn’t work. The additional settings mainly related to display issues. Under the “Settings” section, tick any additional settings such as Disable Visual Themes and Disable Desktop Composition check boxes to try if the program now run properly. Program Compatibility mode is not the guarantee way to make old programs work in later Windows operating systems. It’s wise to ensure that an application is compliant and certified to support newer version of Windows before commit a purchase. Always check for updates with developers as there may be upgrades available. And also, Program Compatibility mode feature should not be used with certain applications such as anti-virus, disk management utilities, or system utilities as it may cause data loss. In newer Windows operating system such as Windows 10, there is Program Compatibility Troubleshooter available (in Control Panel or Settings app) that can be used to help diagnose compatibility issue and determine what settings should be set in Compatibility Mode.